“Job opportunities for university science graduates have failed to match the push to get more students to study science, technology engineering and mathematics (STEM) subjects, warn policy experts. “I think having a world with more people who understand science, technology, engineering and maths is fantastic, but … employers aren’t creating that many jobs in those spaces,” Professor Buchanan said. Quite a contrast, isn’t it? The sad reality is that Australia’s open immigration system has discouraged employers from training and hiring young Australians in favour of grabbing ready-made and cheap workers from overseas. 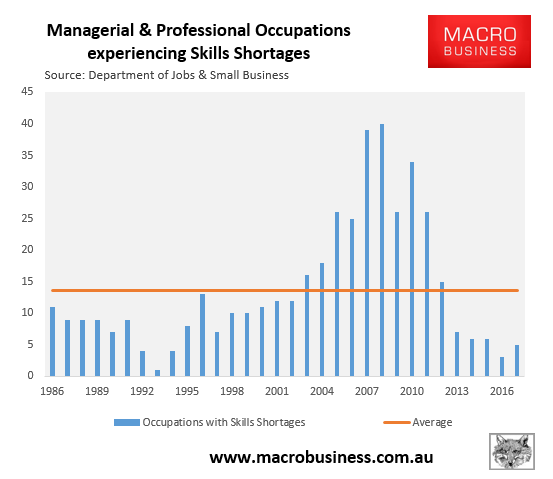 Moreover, if skills shortages were so pervasive across the economy, as argued by Willox, Australia would be experiencing strong wages growth. 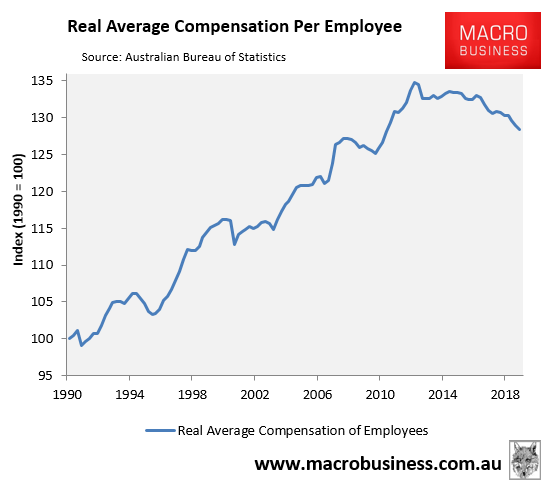 After all, how is it possible to be experiencing a labour shortage at the same time as labour prices (real employee earnings) are falling? It isn’t. The lunacy of Willox’s arguments have been exposed, once again. Socialised losses and privatised profits needs all the help it can get in a per capita recession. The pillaging of public finances requires this kind of drivel otherwise the public may catch on. a) a recent Aussie graduate with no experience, high salary expectations with HECS debts to pay off and requiring training. b) a skilled worker imported on a 457 visa from overseas, who you only have to pay around $60,000 a year, and can work long hours and make do other things by threatening to withdraw visa sponsorship. The locals who pay tax supporting kids to get qualified, paying the taxes of the teachers, not so much. Perhaps the children should just leave the country and go to a place where young people are valued. My local butcher seems to have replaced the aussie students that work there on the weekend with some vibrants. I’m not sure how i feel about this. Disclaimer: before anyone chooses to get outraged, I’m not a racialist, just describing a situation. A lot of the ‘skilled’ 457 visa’s is see are pretty light on relevant experience as well. All about wages. Maybe there is just too many stupid Australians. 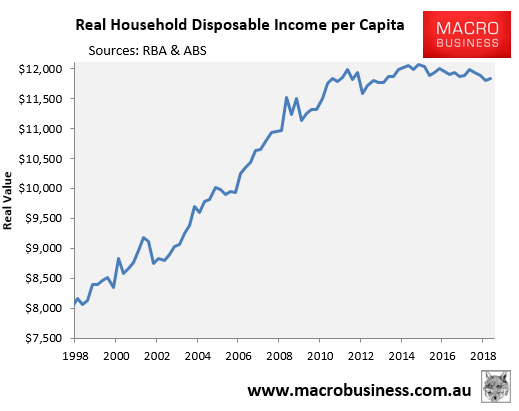 After all, most of them believe that house prices can keep rising exponentially forever when it’s been obvious for years that is a huge bubble. Smart enough that less of them are doing STEM. “skilled” immigrants think house prices only go up. See the Guardian article saying STEM does not match the hype. where many of the Indian etc skilled workers were interviewed as they only were driving taxis. As UK is considering a points based system. The skilled visa has led to an oversupply of STEM graduates (from the Unis with 2 year visa after) and skilled immigration. There is not demand for the total number from immigration. The other problem is there is less demand for the increased number of local graduates competing with 10 year experienced immigrants as 457 salary is less than a graduate salary now.. There is no shortage in IT/Stem, merely a shortage of those that can work on lower salaries. And another article saying taking Hairdressers off the PR list will lead to a shortage of high end hairdressers. Yet many hairdressers in the big cities are paid the minimum wage on temporary visas. If there were skill shortages, then we would ensure those granted Permanent Residency who hold such skills, be tied to jobs that utilise such skills. But we don’t. As it’s been said before, we are running a quasi-low skilled migration programme, where there isn’t the demand for supposed ‘skilled’ migrants and they instead end up in low-skilled work (where more jobs are given we are moving into a sevice-based economy). That’s why STEM wages are exploding….oh wait…. A STEM shortage? But hasn’t this been the plan that Australia and Innes has been working towards for the last 30 years? If you destroy manufacturing (stop making things) and replace it with a “service economy” delusion with debt-based real estate speculation and mass immigration as your wealth producing industry you ensure that no one is going to invest in science; Then if you impose massive massive debt upon STEM students who have very limited career choices (now that we don’t make things) they will tend to drift into careers that follow the money; Then flood the market with “engineers” from developing countries without the requisite English communications skills or understanding of the work and professional ‘culture’ and you devalue Australian STEM anyway; At the same time cut public science investment in universities and impose a board structure on public science that is stacked with industry types interested in short-term profit and maintaining the status quo (rocks and avoiding new industries); Have a parliament full of lawyers, finance sector parasites and scientific illiterates who have no concept of how a culture and economy supports STEM – not the other way around – and the cunning plan is complete. People like Innes Willox are deluded. He was the water carrier for the most extreme neoliberal madness that has progressed all the above (working in the Kennett government). He’s embraced mass immigration as an alternative to building a sustainable and forward-looking society (more on the model of Finland, Sweden, Holland or even Germany) Willox has done all he can to feed the monkey on all our backs. Now he believes that a bigger and fatter monkey will save us. Time to go McBollox. You are the the Grim Reaper of an ideology that has poisoned the culture we badly needed in this country to support STEM. That you think you can ship STEM skills in adequately demonstrates how little you know about STEM itself. Over 30 years you’ve helped undermine our productivity and capacity by being the balance sheet goblin to the big end of town. It’s as baldly ironic as the rug on your head. We need to import more skilled wigmakers, obvs! Massive shortage of programmers and software architects willing to work for 50K. Abuse of the 457 system (and whatever replaced it) is endemic and entrenched. Being an affected STEM graduate at one point I even thought of “if you can’t beat them, join them” by starting up a labor hire company that exploited the scheme. To add to that, I have seen entire teams of existing Australian employees replaced with a team of 457 employees. After the local team was terminated, the newly trained 457 employees were then sent back to their home to carry out the task offshore. This was a common practice and done in broad daylight with no repercussions. My local fish & chip shop takeaway has sourced skilled migrant workers to my horror. Australia Lebanese Christian owners now have Indian helpers in the shop – WTF??? long time customer, I am thinking of taking my business elsewhere. Check this job ad to see how a really good business, one I’d like to work for, writes an ad. They deserve the extra exposure I’m giving them here. (I’d go for it myself, but I’ve got other plans). “Suit Parents” – so can we get the elderly migrant parents onto this then? When profiting from demand: But muh free markets! When demanding labour: Somebody save us! Partof the answer is that aus STEM graduates have rubbish skills that don’t need the needs of employers. This is because it’s all been dumbed down to support the high % of international students. Don’t hope, leave. If things do turn around, which given what I’ve seen the last 20 years I cannot see happening, then come back and with experience and some hard exchange in your bank account. This place is rooted, don’t waste your best years here.. Follow st Jacques advice. It’s good advice. (Somewhat Ex STEM) engineer here – follow the advice and leave. Don’t hesitate. Head for an advanced manufacturing economy like the US or Germany. Regrettably Australia has little to offer you if you want a real career in engineering or technology. After 20 years pushing STEM uphill while my ability to charge a premium for leading edge skills was progressively “competed away” by offshored and later, onshored, low-cost “talent”, I switched into a tech-aligned but non tech-centric role where I can use my deep tech skills at substantially greater salary, within a niche sector far less likely to be similarly disrupted. For you however, at the start of your career journey, I say take the leap and head overseas. Best of luck to you. I’m employed in the STEM field. Consulting Engineering to be specific, my sister also completed a Bachelor of Science about 10 years ago. Like everything in the world – this whole issue is more complex than it seems. I don’t have any answers but here are some facts from my experience. I would like to point out a gross inaccuracy in the use of what I think is overall wage growth vs wage growth in STEM (in fact STEM is not one market by ANY sense, so even this would be a gross oversimplification). Local University Graduates don’t have the ability/information/will to respond to specific demands in the right industry! You start your degree and hope to know the market demands in your chosen degree four or five years later? Industry needs to do a better job informing uni’s and student about what skills are required. Thing is industry doesn’t really know. Some STEM fields are BOOM BUST, take civil engineering for example. In Sydney two or three years ago employers where shipping in civil engineers from wherever (mostly UK) with a pulse. Forget price, the NSW infrastructure boom meant they needed bums on seats regardless of anything else. In two years time (or maybe now) a huge number of those people will be let go (many brought in on contracts). Further to this point STEM degrees are NOT easily transferable and you need to pick one at the start. I would not hire a science graduate for a job as structural engineering graduate and so pick the wrong one at the start and things will be tough. Further to the above… The STEM field is not one market for graduates! Not even close!!! To say that there is a shortage in ‘STEM’ is so misleading. There is a massive over supply of Science Teachers. There is a massive over supply of Science Graduates (basically unemployable without some specialisation). There is an undersupply of IT Graduates but my guess is that this is very price sensitive (hence the demand for overseas cheaps graduates). There is a massive oversupply of Chemical Engineering Graduates, massive undersupply of other engineering graduates etc etc. For the record we employ almost entirely local graduates, not because we are morally righteous but because we demand lots of client interaction and strong communication skills. Ie I need someone who can hold a conversation in english and knows local codes, even if only from Uni. And my family with a Bachelor of Science didnt get a job for years until retraining in a much more specific field. Lastly – you cant write off skilled immigration completely even if its being abused by the IT side of the STEM field – when for example the NSW government launches on a ballistic amount of infrastrucutre to happen all at once where else do you want the engineers to come from? Graduates take about 3 years to become trustworthy with their designs it would be literally impossible to design the infrastructure in the timelines without some skill migration.